Get set for a live-action version of Transformers, as the company behind giant Japanese robot Kuratas has accepted a duel challenge from upstart US challenger MegaBot. However, it'll only fight on one condition: Combat must be hand-to-hand with no guns. Kuratas has been around for three years and even went on sale for $1.35 million at one point. Since MegaBot was only just completed, the Japanese company was taken aback by the offer to fight. Still, it couldn't resist needling its new rival. "My reaction? Come on guys, make it cooler. Just building something huge and sticking guns on it is... super American," said CEO Kogoro Kurata. 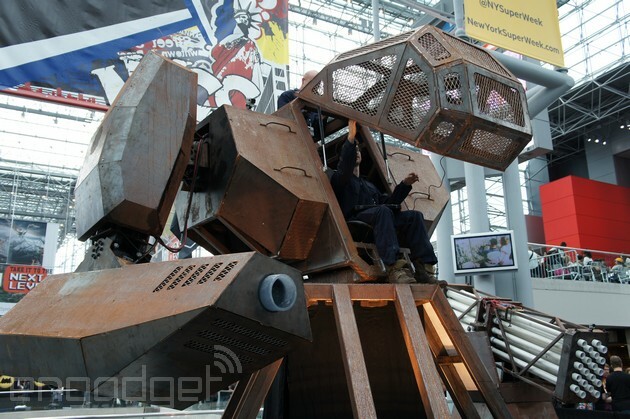 In one corner, you've got the cruder, but larger US MegaBot at 15-foot tall and 6 tons. With a rusty finish, it rolls on tank-like tracks, can hold two "pilots" and fires giant paintballs at speeds up to 100mph. As you'd expect, the mech has only one purpose: "We're bringing video games and science fiction to life in the form of internally piloted giant fighting robots," MegaBots co-founder Gui Cavalcanti told us. The mech concept first appeared last year in a failed Kickstarter, but was eventually completed with help from US software giant Autodesk. In the other corner is Suidobashi Heavy Industry's more polished Kuratas bot weighing in at 9,000 pounds and standing at a lesser, but still insane 12-feet high. It packs a giant BB gun rather than paintballs, has wheels instead of tracks and can hold a single pilot. In response to the US challenge, Kurata said, "we can't let another country win this. Giant robots are Japanese culture." He concluded by saying, "Yeah, I'll fight. Absolutely." He added that he wants the combat to be "melee" style, meaning hand-to-hand with no guns. "I want to punch them to scrap and knock them out to do it," Kuratas said. He left it up to MegaBots to organize the duel, so we'll have to wait to learn the exact time and place, but it should happen in about a year. Both bots are more mech suit than robot, as they require human pilots to control them -- so we imagine there'll be strong safety measures in place. Hopefully the epic-sounding scrap will live up to our already-sky-high expectations, and be more Ali/Frazier and less Tyson/Spinks.